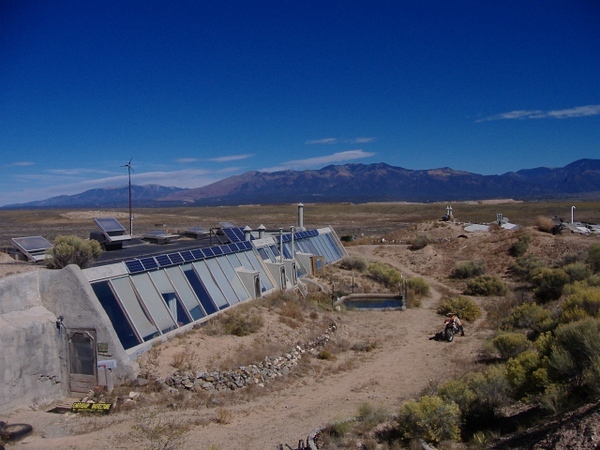 On Friday, October 12 we paid a visit to the Earthship Biotecture headquarters near Taos, New Mexico. 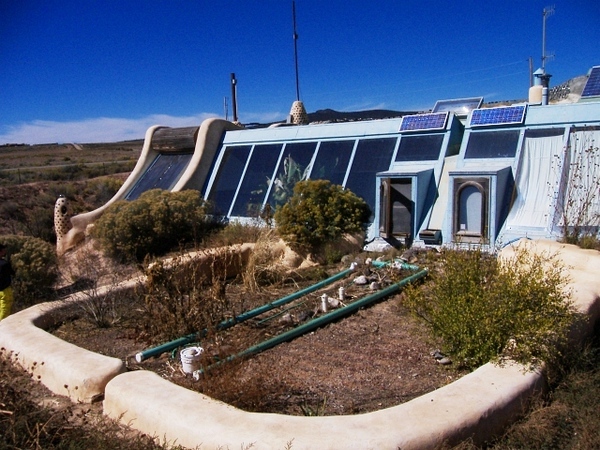 We've long been fans of the earthship concept, so this was a Big Day for us! Rhonda gears up on the Monster. 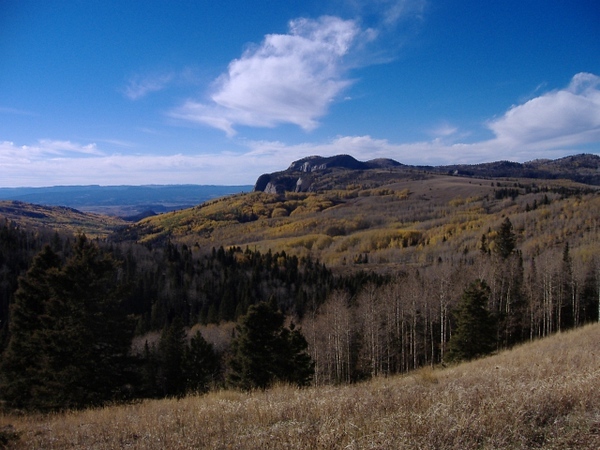 Our route will take us east and southeast on Rt 64, over a high pass between Jawbone Mountain and Burned Mountain. 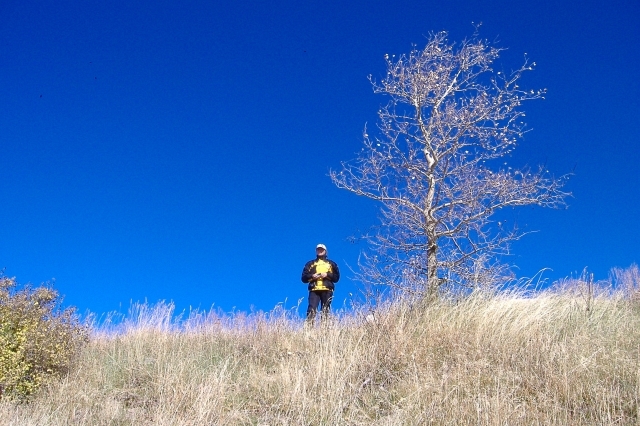 A few miles outside of town we were greeted by a herd of sheep, a llama, and some cowpokes. 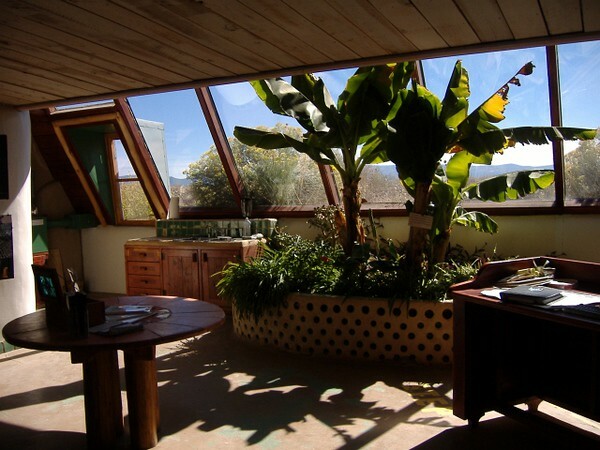 We have descended upon Earthship HQ! 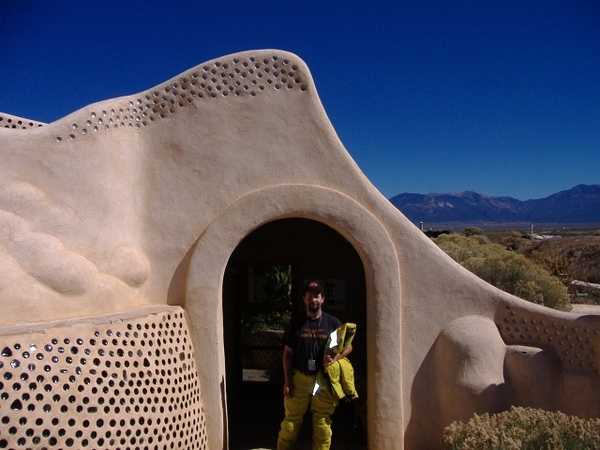 Main entrance to earthship HQ, complete with suspicious character. Note the use of recycled bottles in the walls. 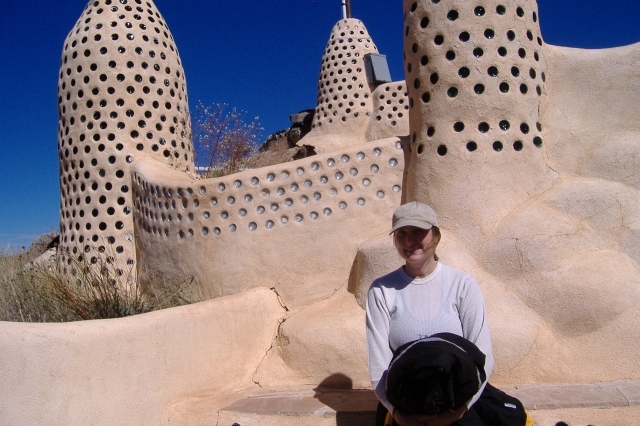 The bottles are meant to take space within the cement, creating a strong matrix. More bottle work at the entrance. Indoor graywater planter with fruiting banana trees. 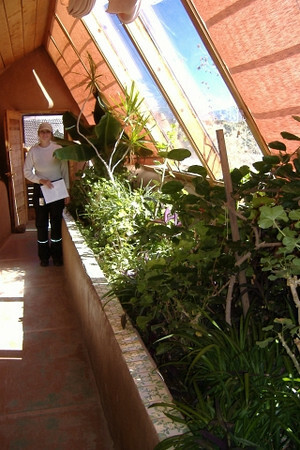 The south-facing windows provide a year-round greenhouse environment. The graywater feeds from the kitchen sink to the left of the planter. Another graywater planter with a variety of thriving plant life. Another view of a graywater planter. 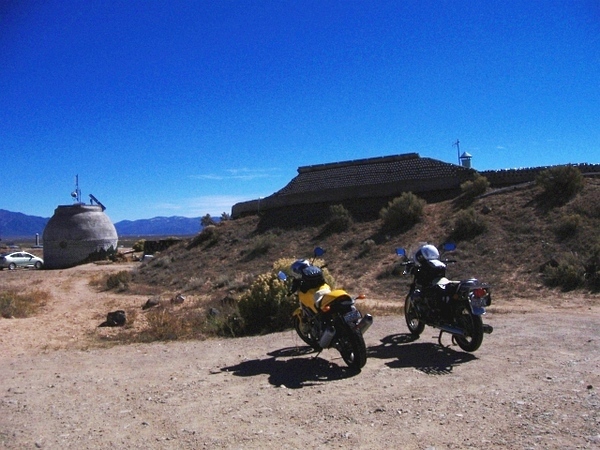 The east exit allows the tour to continue to the outside. 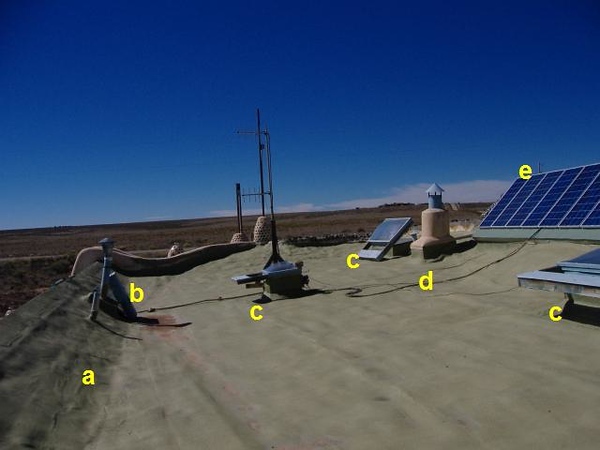 (a) The roof is sloped slightly toward the south for directing rainwater flow into the cistern, which is fed by the drain at (b). Skylights (c) allow lots of daylight to enter all of the rooms of the home. The small fireplace (d) can take the chill off after several cloudy winter days. Solar panels (e) provide electricity. A lined mini-leach field receives and processes blackwater. (The drain pipes are exposed here for demonstration purposes only.) Non-food-bearing plants can safely be grown here. On the far left of the front face is the batch solar water heater. 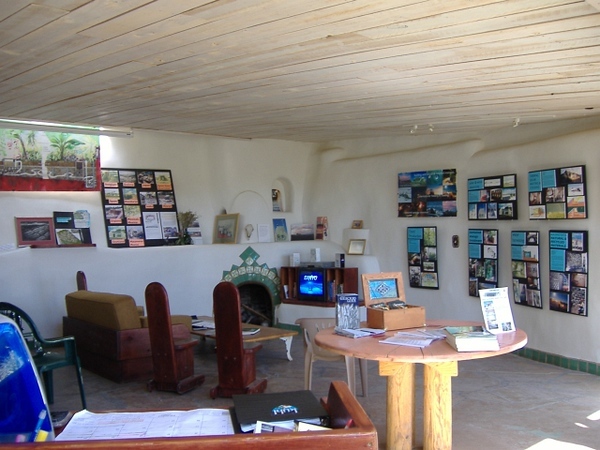 The main living area of the example earthship. 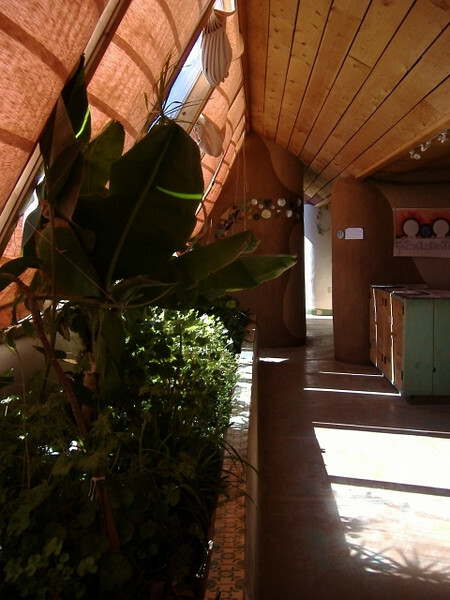 Many features of the earthship building concept are displayed. Rhonda pushed me off the mountain.